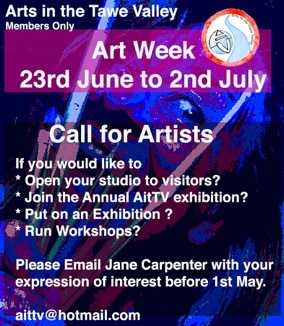 This year’s Arts Week will take place from 23rd June – 2nd July and will give members the opportunity to open their studio, take part in our annual AitTV exhibition in Oriel Lliw Gallery, put on their own exhibition or run workshops and be a part of this exciting week. Members who wish to be involved please email Jane Carpenter at aittv@hotmail.com. There is no charge for this as it is part of the membership. We look forward to another successful week where we can showcase the talent in our area and give people a chance to connect with to artists and creatives.